« Is Ludacris in dire straits? Last month I tried ad hoc for the first time and enjoyed it so much I practically ran home to rave about it. Naturally, when I had an opportunity to return last weekend, I jumped at the chance to go back. Before I describe every disappointment in detail, let me back up for a moment. A month and a half ago, I finally made the drive up to Napa Valley on a Monday night to try the incredibly overhyped fried chicken, which was so good it still managed to exceed my expectations. Shortly thereafter, my friend Jaime pointed out Frank Bruni’s article, which listed ad hoc as a top 15 restaurant of the year (and described it as “some of the best fried chicken I’ve ever had in my life”). After reading my review, my friend Victoria insisted we go up to wine country, so we could enjoy some wine and she could get a taste of ad hoc herself. When we sat down at ad hoc, only one of us was handed a menu. This act alone may have been been able to portend the troubling experience to come. Yes, the meal is prix fixe and written in chalk on the blackboard above the bar, but did this mean we were expected to share the menu and take turns reviewing it? Apparently so. The waiter who greeted us with one lone menu was the same server I’d had last time I was at ad hoc. During my visit last month, he spent a lot of time at the table, busting impromptu dance moves, divulging his favorite hole-in-the-wall burrito places, and swapping notes on top San Francisco restaurants. Although I mentioned this to him, his face displayed zero recognition of me. Had the rapport between us been sheer imagination? The bread basket is served before ad hoc’s first course, and stays the same every time. Or so I thought. That was, until our server described the three-grain bread to the table next to us, and I realized it was missing from our basket. After I inquired about the discrepancy, the aforementioned bread was promptly added. 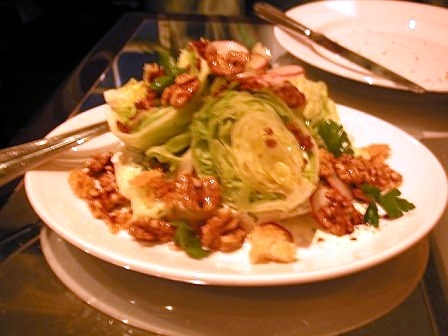 We began with a salad of iceberg rounds, with bacon bits, radish slices, celery and walnuts, sitting atop a pool of ranch dressing. While the presentation was pleasant, I would have appreciated the ranch dressing on top of the wedges, as we were forced to reconcile lettuce with plate simply to dress our salads. 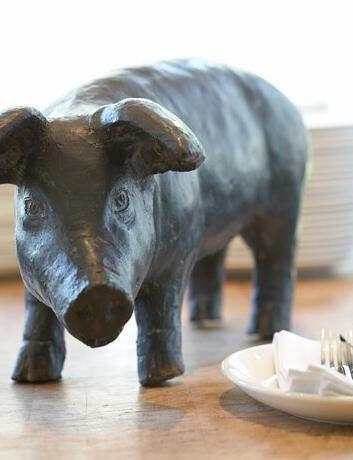 Our waiter described that night’s pork as fatty and highly marbled. While the pork chop was tasty, I have had a better-marbled pork chop, and certainly a more tender one. Nonetheless, the tomato vinaigrette which topped the pork was delicious, and I could have used more of it. 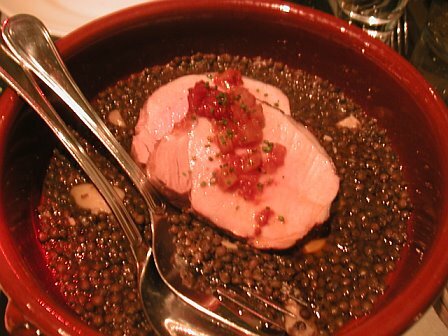 The chops sat in a bed of green lentils, which added absolutely nothing to the dish in the way of taste. But the worst part of the night was yet to come. 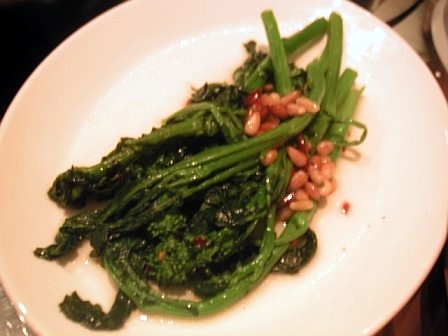 We would soon find out that it was the broccoli rabe, which accompanied the pork loin as the main course of the meal. The greens were stringy (I wondered if this was because they were over the hill), limp and overcooked. They were also completely flavorless, lacking the slightly sweet, slightly bitter taste that I’ve come to appreciate in broccoli rabe. Even on an off-day, I could have made a better dish. Almost immediately, Victoria found a hair in her broccoli. It seemed like eons that we sat, not eating, waiting to flag someone down. Finally, my friend approached our waiter herself. He said he would be over immediately, but then proceeded to ignore us completely. Surely Thomas Keller would consider this unacceptable! I thought to myself. The situation wasn’t addressed until someone else came over to check up on us several minutes later. When we explained the situation to him, he asked us what we would like to do. Obviously, we told him, we wanted to have the dish removed from our sight. Both of our plates were promptly removed and replaced with a new serving of pork loin. I’ve never met a cheese I didn’t like, but the goat’s milk cheese on our plate was the closest that I’ve ever gotten, as it was exceptionally rank in a bad way. I wasn’t able to eat it without thinking obscene thoughts. 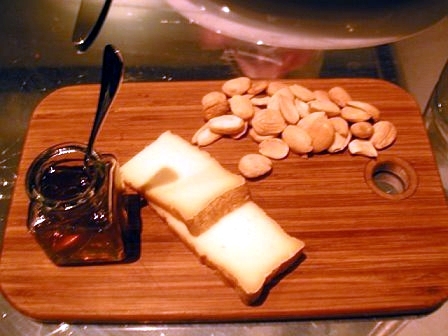 The last time I’d been at ad hoc, each dish was described to us in detail, including the cheese plate. This time around, there was no mention of where in California the cheese was from, what type of cheese it was, or even a general description of taste. It wasn’t until our chocolate brownie dessert came around that the exact same waiter seemed utterly concerned about our experience at the restaurant. 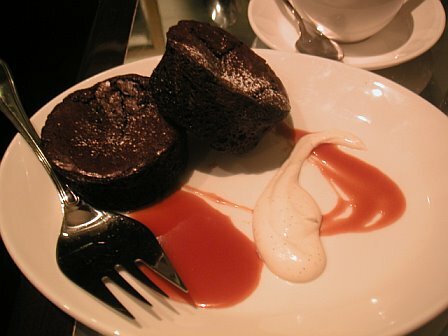 Victoria and I had been engaged in a discussion about how the dessert was more cake than brownie, and was so close being a molten chocolate cake (which would have been delightful), yet so far away. “Is everything OK?” our waiter asked. He was suddenly, inexplicably able to identify that the situation wasn’t handled correctly, yet he wasn’t sophisticated enough to rectify it. When we told him the dessert didn’t quite do it for us, he repeatedly offered us fruit, nuts and cheese instead. At that point, however, we simply wanted him to leave us alone. We left feeling underwhelmed (by the food), crestfallen (by the high hopes), and irritated and guilty (by the service). As I like to say, when diners aren’t satisfied, everybody loses. “I will probably never go back there again,” Victoria said to me as we got in the car. I felt disappointed by the inconsistency, and ashamed for having recommended the place. This entry was posted on March 5, 2008 at 5:17 am and is filed under Restaurants, Reviews with tags ad hoc, Thomas Keller. You can follow any responses to this entry through the RSS 2.0 feed. You can leave a response, or trackback from your own site. Thanks for taking the time to spell out your concerns. It’s unfortunate that ad hoc missed the mark for you and your friend on your recent visit. My greatest hope is that you’ll give ad hoc another try sometime in the future. Until then, keep writing! Wow. This sounds like a wholly unsatisfying experience. I think the hair in the food (and the incredibly poor response) in the clincher. I’m not sure who your waitperson was, but at the table next to us was a couple (a man and a woman). The wait staff came out with a dessert topped with a candle, to celebrate the man’s birthday (obviously a surprise from the woman). He was teasing the waitperson, “No, it’s not my birthday.” The woman says, “Oh yes it is.” And the wait person looked like a very confused deer caught in the headlights (or, like a 22 year old with no idea what to do). His response was, “You’re not lying are you?” Hmmm. Thanks for posting to my site! Good luck with your next food adventure! While I have eaten at ad hoc a number of times I think that your overall indictment of the joint is totally unfair. You felt slighted that your waiter didn’t remember you from last month?Tthough he probably serves 300 people per week…. From there you didn’t like that the “RANCH” dressing was on the bottom and you felt that the ingredients weren’t top notch when I would be my left eyeball that they are better than any restaurant, supermarket or farmers market can source. I’m sorry you feel that my post is unfair. Perhaps it was wrong of me to expect my waiter to recognize me (although this was probably more of a personal disappointment as I thought we’d had a rapport the first time I dined there). I am definitely not a “hater” as the first time I reviewed ad hoc, I had absolutely nothing but good things to say about it. In fact, most of the places I write up aren’t even reviewed negatively. If my experience is merely average and lacking in any memory whatsoever, I won’t write it up. The first time I was there, I was with my boyfriend and we both got handed menus. It’s not a big deal that my friend found a hair in her food?? We both inspected it, and it definitely belonged to neither of us. In my friend’s defense, I wouldn’t have eaten it, either. That hair could have come from any part of any person’s body. Disgusting, unprofessional and definitely not hygienic. I actually really enjoyed the ranch dressing (I don’t know where you got the assumption that I didn’t) — we actually loved that it had chives in it. I am pretty sure I never said anything about the ingredients not being top-notch. For the record, I don’t like Ruth’s Chris either, and I much prefer a stinky French Roquefort to a Wisconsin cheddar. I love brownies, too, but this one was dry. I appreciate the feedback but not the nasty comments…so “Gramma,” I’m pretty sure I’m not the hater in this discussion here. One more thing: I noticed you wrote in from a Thomas Keller Restaurant Group IP address, but failed to include that, simply noting that you have “eaten at ad hoc a number of times.” Were you afraid that would take away from your legitimacy? I first of all want to appologize for the above writing of a friend and family memeber that found your blog about our restaurant while visiting us from home. I think that everyone’s complaint is valid and I wish I would have been there to help make it right. nick@adhocrestauant.com is my E mail address and I would love to talk with you first hand about your experience in the restaurant. Especially since it is not who we are, what we stand for or what we are about. Normally we make so many huge fans (just as we did that first night that you were here) that I wonder if we ever slip up somewhere. Here it appears that we have dones so and the only way to help us fix the situation is to bring it to light. Also feel free to check out the blog that we started for our place and other places we have been and tried. it’s still an infant but it’s going to be fun when we can get it open and get enough contributors. wow…i’m sorry you had such a disappointing second experience. I think I’ve been there 10 times and there’s was only one meal that I felt was a bit underwhelming, but even then it was still better than most places. (It was also a pork dish accompanied by a funky-smellng cheese.) I wish you could have gone back on a beef night…they do great things with beef there. gramma’s comment is way out of line and I’m sure it’s not the image Ad Hoc or anyone within Thomas Keller Restaurant Group wants portrayed. On a positive note Susannah thank you for your review. I printed it out and read it out loud at our restaurant’s post shift last night (along with the comments and replies last night) What a wonderful and motivating tool for the staff of ad hoc to see EXACTLY where we could get better. Along with exactly how to respond to criticisms of our prouduct, BRAVO NESSIM! Come on in and lets have some fun. So sorry to hear about the debacle! I’ll admit that I’ve had a few courses at Ad Hoc that were less than stellar (I love cupcakes, but there’s major room for improvement there)..but on the whole I think that the quality is quite good and above average. My first time there was probably the most disappointing, and I think that had a lot to do w/ the very high expectations (service and food) I had coming in. I also think that there’s an element of room for error, given the “ad hoc” nature of the menu. I’m assuming experimentation with better and worse success is part of that process…at least it seems that they’re open to feedback. I would take a gander that those lentils will be around again. Uh, I meant that the lentils WON’T be around again. I am so sorry that you had a lacklustre experience at Ad Hoc. I am a friend of Steph’s and Arnold’s and have been to Ad Hoc a number of times (once with Steph and a few times with Arnold and his wife). On all the occasions, I found the food a delight and the friendly casual atmosphere created by their waiters genuine and warm. As a lover of Ad Hoc (not related at all to anyone there nor ever worked there), I hope you will give the place another chance. And I am sad to hear their brownies were a disappointment as I have been dreaming about those brownies since having had one. And, also, I am delighted to find that the posts by those at Ad Hoc have been so balanced as well as open to everything written in the post. Happy food adventures…and thanks for a great blog. It appears, with the first visit to ad hoc a smashing success and the second a bit of a mishap, that the third time’s going to be the charm. I reviewed this experience thinking the only people reading this would be my friends. I was astonished by a multitude of things: the number of responses that this posting garnered; the defensive remarks that could only come from a patron who passionately loves the restaurant; an immediate gesture from the very waiter who served us; a heartfelt response from the general manager who would care enough about one person’s feedback to read it aloud to his kitchen staff as constructive feedback. But mostly, I was astonished by how much the staff at ad hoc cares about making its patrons feel comfortable and happy while dining at the restaurant. If not for any other reason, this is why ad hoc deserves another chance.